Highly viscous and high solids content of product can damage or even destroy diaphragm, lobe, progressive cavity and other pump types, resulting in costly plant downtime. 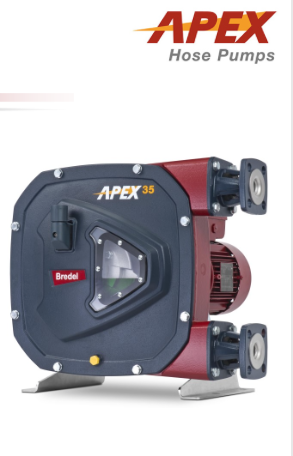 With no rotors, stators, lobes, discs, ball checks or seals to wear out, Apex peristaltic hose pumps by Bredel are able to meet the most demanding applications. Apex pumps are dry running, self-priming and are ideal for abrasive slurries, corrosive acids and gaseous liquids. Contact us to maximize your up-time with the proven peristaltic technology of Apex by Bredel hose pumps. Nibley and Company has built relationships with manufacturers concentrated in the industrial processing business over the past 60 years. Our product offering is not populated by random manufacturers. We have made significant time investments to properly learn and vet the brands we present to you. We stand behind our manufacturers and their products with the highest confidence that the products you receive will be the ones that work best in your process and will be in use for years to come. © 2017 Nibley and Company. All Rights Reserved.